This progressive and visually arresting book is a compelling addition to women's history and belongs on the shelf of every school, library, and home. Together, these stories show the immense range of what women have done and can do. May we all have the courage to be rad! For teachers, this book is appropriate for grades 6-8 and could be used in either Social Studies or English classes, or as part of a text for a multidisciplinary unit. It can also be used as a Common Core text for grades 6-8 Social Studies/History - CCSS.ELA-LITERACY.RH.6-8.1-10. KATE SCHATZ is a feminist writer, educator, editor, and the author of the 33 1/3 book Rid of Me: A Story. She is the co-founder and leader of Solidarity Sundays, a nationwide network of feminist activist groups committed to resistance and justice. MIRIAM KLEIN STAHL is an artist, educator, and activist. They are the author and illustrator, respectively, of Rad American Women A-Z and both live in the San Francisco Bay Area. "An international array of badass women through the ages and up to the present...[and] a happy contrast to so many Eurocentric “world” surveys." "[R]eadily accessible to children and teens...Stahl’s cut-paper portraits provide handsome visual tributes to the women." "Imagine learning history right the first time, without ever having to unlearn all the lies and omissions. RAD WOMEN WORLDWIDE lifts the doom—maybe this is, in fact, a wonderful time to grow up." "This book needs to be in every school, library, and home." "A work of astounding beauty and urgent importance. The enthralling stories of these brave, amazing women—and the stunning illustrations that accompany them—are sure to move and inspire kids and adults alike. We all need this book: girls, boys, mothers, fathers, educators, engaged citizens—really, all of us who care about a more just and balanced world. Thank goodness I don't have to raise my daughter and son without it!" "How do you help young girls change the universe? Show them the women who have already done it! This beautiful book shows girls (and boys) the power and importance of each person who decides to make a difference. A celebration of smart, brave, tough, creative, kind, beautiful, hopeful, and wise women!" "Our history books are filled with incredible stories of heroes and rebels, villains and visionaries, but too often it’s men who occupy all the starring roles. 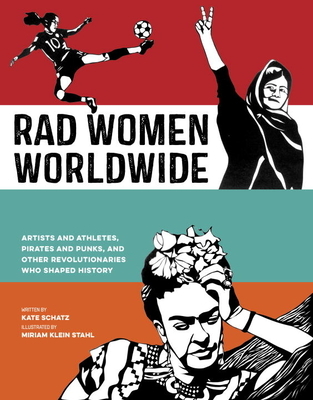 RAD WOMEN WORLDWIDE boldly challenges the male-dominated version of history we’ve been sold, offering us a new vision of the past that brings women out of the historical shadows. In these pages, women are made visible at every step of humanity’s journey, across continents and generations, revealing that often we, too, have dared to change the world." "In past generations, a globe was an essential gift for any child, a way for her/him/them to sense the wide, round scope of the world without even having to travel. RAD WOMEN WORLDWIDE is this moment's equivalent of the globe--a gift that will help every child understand the world they share with powerful women everywhere." "Schatz and Stahl are a pair of 21st century Howard Zinns, making the Western canon bawl with this mindblowing, history-expanding, beautifully executed roll call of badass women past and present. Our daughters and son need this book, and so do their parents." "Wow! Like it's predecessor, Rad American Women A to Z, this wonderful book is a browser's delight. Dipping into every story, examining the blunt, bright woodcuts, brings singular pleasures. There are woman to discover and woman to rediscover. And the best part? A long list of more woman to learn about winding it up. Daring to hope there will be more Rad Women books." "Their second well-researched collection of gorgeously detailed paper-cut illustrations is accessible to young readers but fascinating for grown-ups, too. Rad women in this collection are humble, brilliant and theatrical. They pursue human rights as well as women's rights."